Wed, Sept 17 — 7:30-9:00pm SOLD OUT!!! "The mind is like a river. The thoughts are like the various droplets of water. We are submerged in that water. Stay on the bank and watch your mind." MYoga is honored to present A.G. Mohan in a special evening of discussion. In this talk, Mohanji highlights the importance us taking care of our own minds and not getting the stuck in the vicious cycle of always striving for more and other common misunderstandings about yoga in today’s world. Yoga is a path to undisturbed tranquility and awareness. Yet, in today’s world many people have come to think of yoga as being able to perform complex physical postures. The essence of practice and its power to transform is taking a back seat as increasing attention is placed on the external form than the inner journey. As we know, any physical exercise will make us feel better, lighter etc. It will reduce tamas (inertia). But for it to be classified as yoga, it must also reduce rajas (activity) in order to cultivate the state of sattva (clarity). This will only be achieved with focus of the breath and focus of the mind paired with sincere inquiry. What am I doing and why am I doing it? Gradually, yoga movement moves us towards the absence of movement – physically and mentally. A.G. and Indra Mohan have devoted their lives to daily study, practice and teaching of yoga. 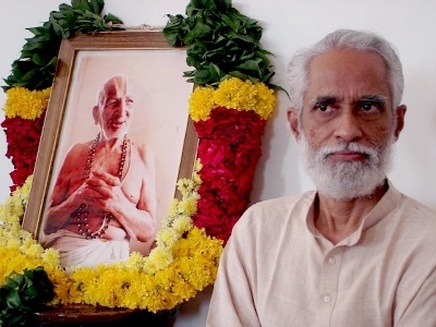 As long-time, close personal students of the legendary yoga master T. Krishnamacharya, they are deeply grounded in the ancient texts and the power of proper discernment on the path of yoga. Any method they teach is sound and carries the clear, timeless message of yoga as a path to freedom from unhappiness. For more information, please visit svastha.net.